I was in the kitchen again this weekend doing some baking and as you seemed to like my Ginger Cake recipe that I posted just over a week ago adapted from Delia Smith (The pursuit of...Home baking), I thought I would share with you these homemade delicious rustic English scones that I made yesterday too. 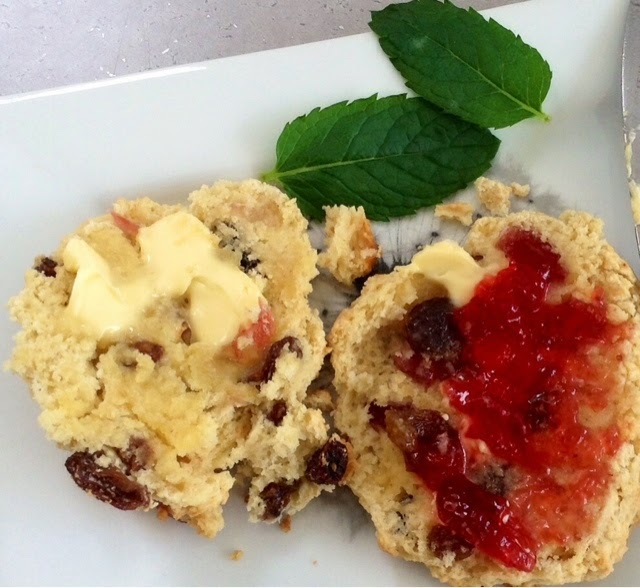 So delicious served warm with butter and strawberry jam...or if you're really treating yourself, traditional clotted cream and jam....scrumptious! Like I said before, once you have the basic equipment/utensils and store cupboard ingredients, you can whip up anything you like without having to make special trips to the supermarket. I found a recipe by Rachel Cotterill using plain flour as I didn't have any self-raising and adapted it to include glace cherries as well as sultanas. Preheat oven to gas mark 8 (220c fan oven) and lightly oil baking sheet. Sift together the flour, baking powder and sugar. Add milk a little at a time, stirring until there are no dry patches of flour left. Then either roll out the mixture onto a floured surface and use a cutter to make your scones or just divide the mixture into eight balls for a more rustic look (I did the latter!). Arrange on a baking tray (remember they may spread a little so leave space between each one) and bake for 10-15 minutes. Allow to cool for a couple of minutes, but serve warm as they are mouth-wateringly delicious this way! Voila! Eat and enjoy this summer time treat in the garden! I may have a go at baking my first chocolate cake next time so look out for that one soon - oooh exciting!